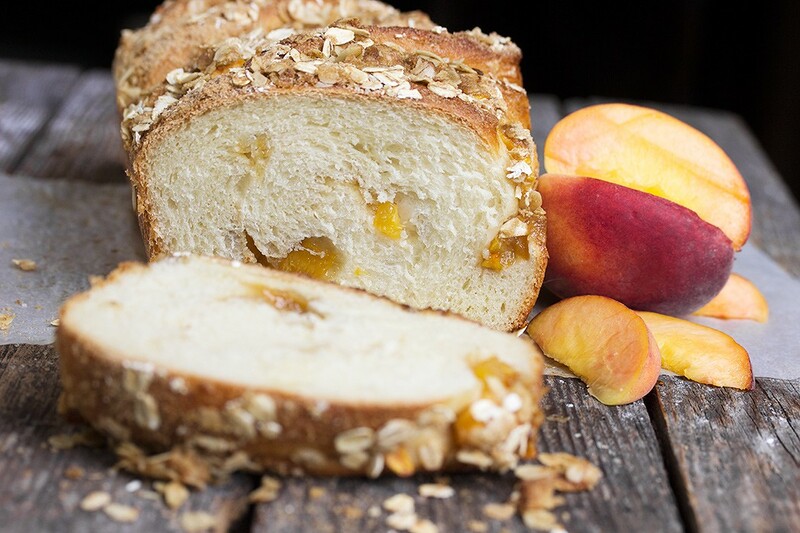 Inspired by the classic dessert, this fresh peach yeast bread is studded with fresh peaches and topped with a crunchy oats, brown sugar and butter topping. 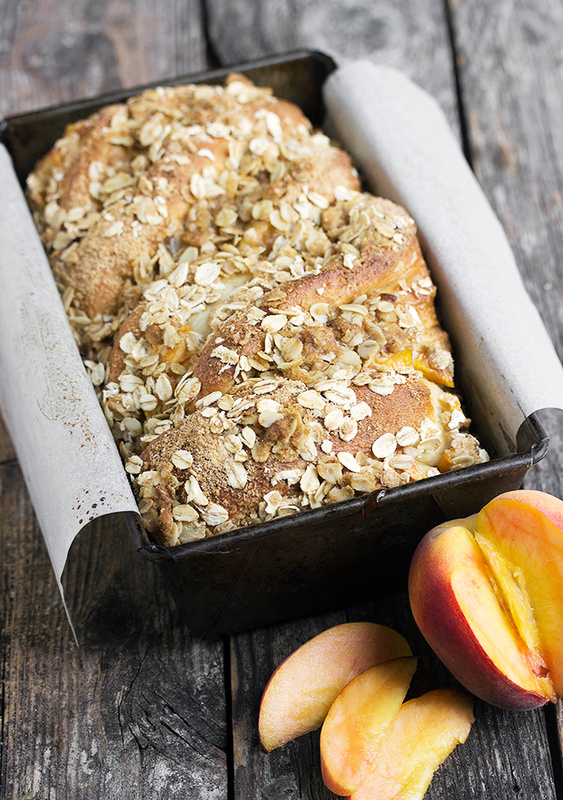 It’s peach crisp in bread form. I don’t think it’s a secret that I love to bake bread but honestly, it’s been a while since I kneaded some dough. Warmer weather has something to do with that. All the great summer fruit though is hard to resist. I love fruit in breads! 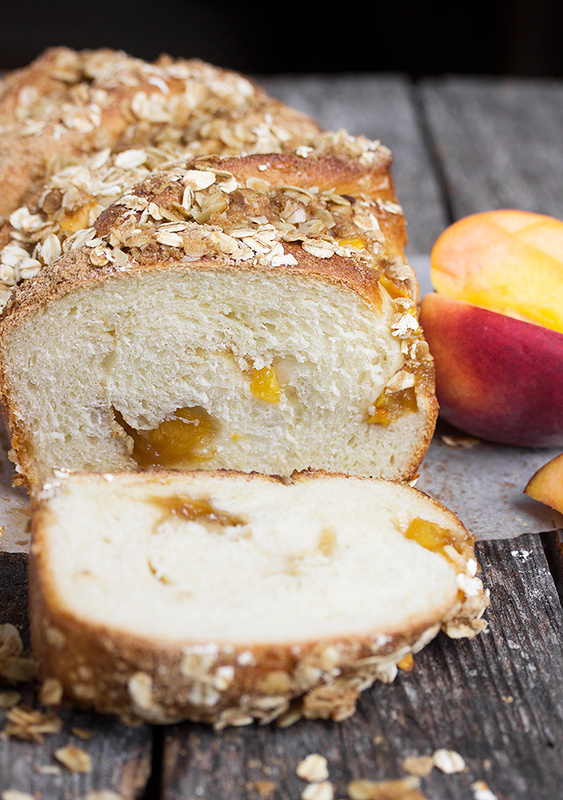 This Peach Crisp yeast bread was inspired by the classic dessert. In the bread itself is chunks of fresh peach and a bit of brown sugar. On top, is a crunchy topping of oats, brown sugar and butter. 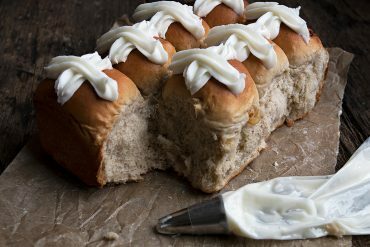 While lightly sweet, it is perfect breakfast bread and despite the topping, it is totally toast-able. You’ll want to start with just ripe or ever-so-slightly under-ripe peaches, to keep the moisture under control. I like to keep the peach chunks a decent size, but not so big that shaping the loaf becomes a nightmare. About a 1/2-inch dice works well. This bread keeps well and freezes beautifully. Enjoy it out of hand with butter, or carefully place in the toaster (so the topping doesn’t fall off) and toast. Inspired by the classic dessert, this bread is studded with fresh peaches and topped with a crunchy oat, brown sugar and butter topping. Great out of hand with butter or toasted. Keeps well and freezes beautifully! 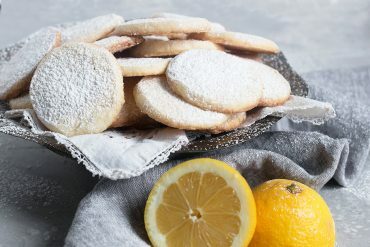 In a mixing bowl or the bowl of a stand mixer, combine the flour, salt and sugar together. (Tip: If measuring your flour in cups, without a scale, hold back 1 cup to add as needed later). In a large measuring cup or bowl, combine the water and milk and whisk in the yeast until dissolved. 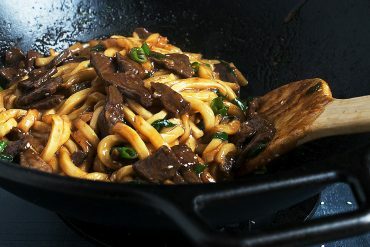 Add this mixture, along with the melted butter or oil, to the dry ingredients. Mix by hand or with a dough hook, until the mixture is combined, about 2 minutes. Let the dough rest for 5 minutes. Transfer the dough to a lightly floured surface and knead for a couple of minutes, then form dough into a ball. Place the dough in a lightly oiled bowl, cover with plastic wrap and allow to sit at room temperature until doubled in size (about 60-90 minutes). Grease one 9x5-inch loaf pans and line the a piece of parchment paper that covers the sides and extend a souple of inches over the sides. This will make it easier to get the loaf out after it's baked. Set aside. Remove dough to a lightly floured surface and then, using a rolling pin, roll into a rectangle approximately 10 inches wide and 16 inches long.Sprinkle the dough with the 1/4 cup of brown sugar, then top with diced peaches and cinnamon. 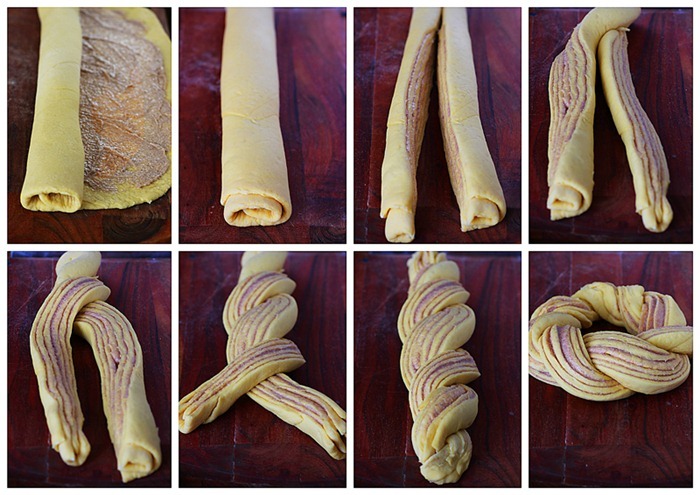 Starting on the long side, gently roll the dough jelly-roll style and pinch the seam together at the end. Also pinch the ends together. Using a sharp knife, with the dough roll perpendicular to you, cut the roll of dough down the centre, lengthwise. Rotate each cut piece so that the cut sides are facing upward and place them side-by-side. Don't worry if some of the peaches fall out. You can replace them later. Pinch together the farthest end. Keeping the cuts sides facing upwards as much as possible, place the right-side piece over the left-side piece. Straighten it up and then repeat, pinching together the end closest to you. Gently push both ends towards the centre to shorten the braid to the length of your pan (9-inches). Using a bench scraper or spatula, carefully lift the dough into the greased loaf pan. If you had some peach pieces fall out, simply add to the top of the loaf. Cover with a piece of plastic wrap and let rise until puffy and cresting the sides of the pan by about an inch. Prepare topping, by combining the oats, cinnamon and brown sugar in a small bowl. Using a fork, press the butter in to the mixture until incorporated. Sprinkle evenly over the top of the bread. Bake in the preheated oven for 45-50 minutes total. 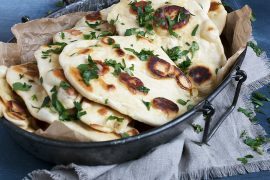 Check after 35 minutes of baking, rotate pans front-to-back in the oven and loosely cover with a piece of aluminum foil if necessary (if bread is already well-browned), to prevent the top from over-browning. Bread should reach about 185° F. internal temperature in the centre. Remove the bread from the oven and allow to cool in the pans for a couple of minutes. 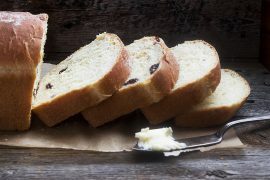 Run a sharp knife around the edge of the bread and carefully remove the loaves to a cooling rack by pulling on the parchment sides. Allow to cool for 1 hour before slicing. 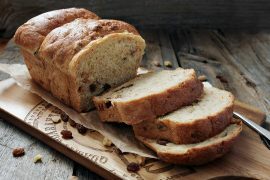 This bread is just perfect for the summer time! Do you know if it can make two 8X4 loaves of bread? Hi Claire, You could, but they would be quite small loaves. If that’s ok, then simply adjust the baking time down a bit, as the smaller loaves will of course bake more quickly. Mmm…now I’m dreaming about getting my hands in some dough. It’s been a while for me too. Too hot and humid here! But I’m craving this bread big time! Thanks Liz. If you get a cooler day, I definitely recommend this one. It was delicious!! What is this genius? My goodness, what a perfect summer breakfast. Just look at those juicy peaches! I want to toast it and slather it in butter. This bread is baked to perfection.. seriously wow. 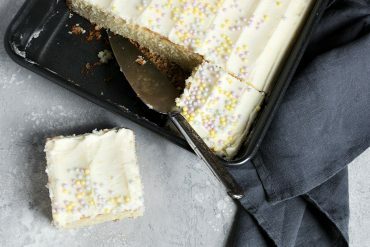 I wish I had a slice now! I want to stop everything and make this bread :). That topping is irresistible! 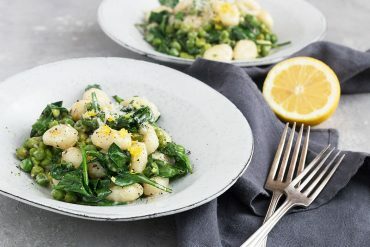 This sounds so light and summery! Your images just jump off the page Jennifer; gorgeous! Now if we could only have a scratch and sniff feature! Wow Jennifer, what a great summer bread! I have become a fan of making homemade bread really just over the last year or so. I love a nice slice in the morning with a cup of tea! 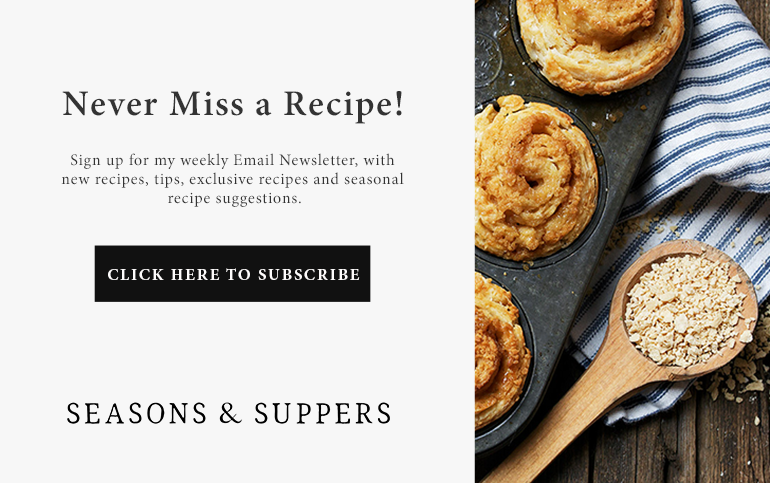 So many lovely peaches at the market recently too so this recipe will be put to good use! 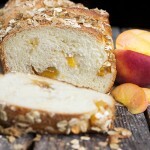 Wow, this is such a creative recipe – I adore peaches, but never think to bake them into bread. I have wanted to try this method with the dough, would you call it a ‘pull apart’ bread? Thanks Sue :) It’s not a pull apart bread. The way it’s cut and twisted, it bakes together in to quite a classic loaf, so it’s very sliceable. Thanks so much, June. The crispy topping was delicious on the bread!